In order to send SMS in non-business hours, i am looking for a SMS Gateway compatible with PRTG that I can to connect in my LAN. What kind of Gateway can I use? Basically every SMS gateway that has an HTTP API should work well. Please find here an example for SMSEagle showing this in more detail. In the interests of redundancy, do you know if it's possible to use two SMS Gateway on PRTG, like SMSEagle? For information, I have a PRTG cluster on two physical servers. You can configure only one SMS gateway, there is no fallback option as with the SMTP delivery options. 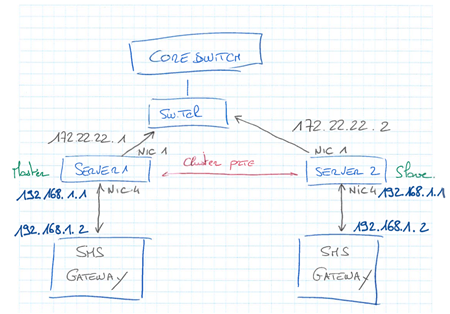 The master in a cluster also mirrors basically all the configuration details regarding notifications to the failover. So the configured SMTP server(s) and SMS gateway need to be reachable from master and failover, otherwise you lose notification capabilities on the failover, when it indeed needs to take over, because the master is down. We have two physical servers with 4 NIC. Actually, we only use one card per server. 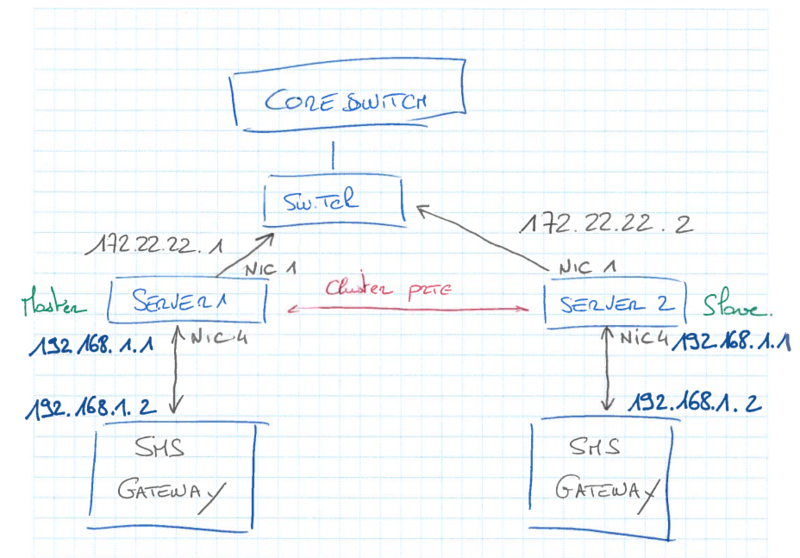 We want to connect the SMS Gateway on each servers on another NIC, with IP address and private network visible only for the server wich have the gateway. The idea is that Gateway will use the same configuration, so the same IP, so the same custom URL would be used. In order to understand our project, please see the schema. If you can make sure that the failover reaches a different gateway by the same IP as it is configured on the master, then yes, it should work.